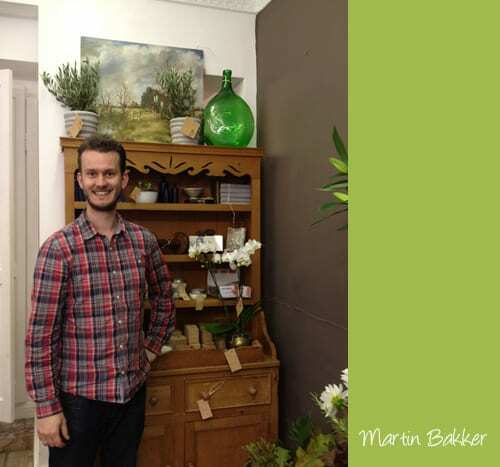 For my Florist Friday blog post series this week, I’m delighted to feature an interview with Martin Bakker of Martin & The Magpie. Where I grew up in Holland, we were surrounded by flower growers. It seemed natural to get a weekend job helping out at a rose growers. I learnt all about the growing, cutting and packing side of the business and eventually I got interested in the artistic side…how to arrange and display beautiful flowers, not just cut and pack them. I got a job in a florist which offered a day release so I could attend college for the techniques and worked in the shop to gain masses of practical experience. 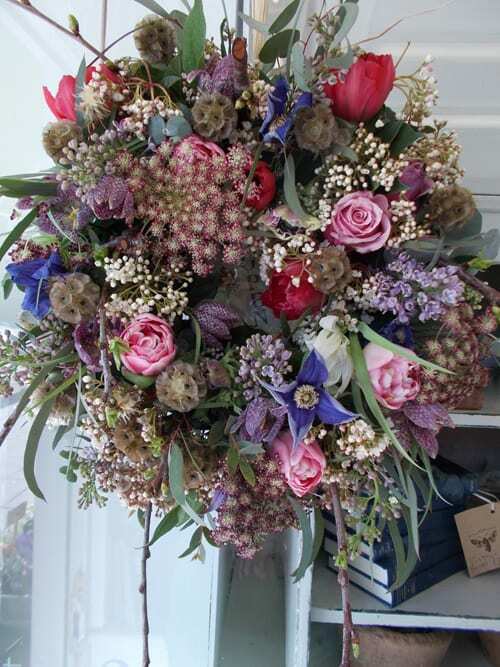 In 2006, I moved to Amsterdam to work for a high class city florist which offered more experience in event floristry. I got to work in some amazing venues such as The Rijksmuseum, prestigious city corporations like Gassan Diamonds and Merrill Lynch, and top hotels like The Hilton. After meeting Emma (now my wife and business partner), I moved to England. Firstly I worked in an Interflora florist to see how things were done here, but quickly moved to London florist Pulbrook & Gould. 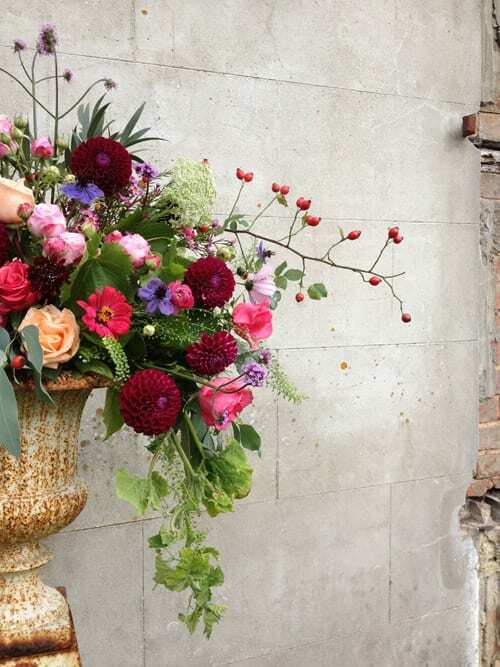 It was here that I really embraced the English country style of floristry and again worked in some wonderful places like The V&A, The British Museum, The Wallace Collection and Hampton Court Palace as part of their event team. Martin & The Magpie was opened in 2010 in the beautiful market town of Hungerford, Berkshire. The shop had been a florist for twenty years but it had closed six months before and was standing empty. We had decided to look for a place in the country to live and fate seemed to take a hand and 120 High Street was there waiting!! Martin & The Magpie is a family run business (myself, my wife Emma and my mother-in-law, Kay) offering all aspects of floristry. 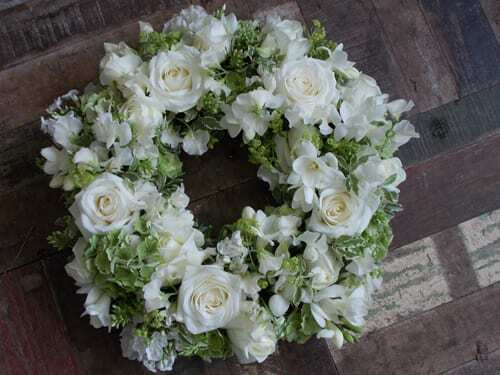 Not only do we sell cut flowers, but we also cater for weddings, funerals & events. We supply corporate clients and have regular contracts with private houses. We do think that these days you have to be different. 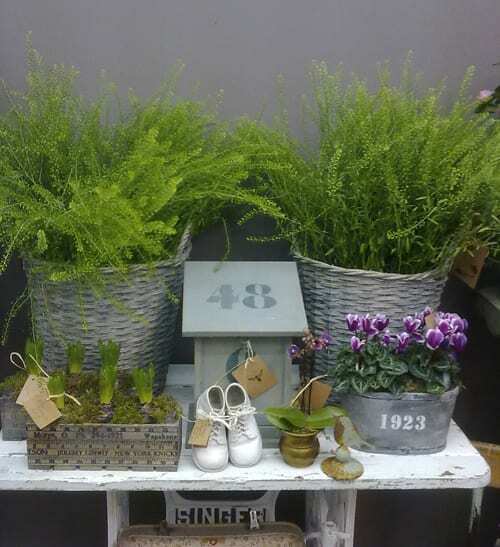 So apart from flowers, we also sell an eclectic mix of vintage pieces of furniture and garden items as well as plants, containers and other quirky items that take our fancy. It means the shop is constantly changing and evolving. I’m hugely inspired by the paintings of the Dutch Masters (we have run courses with this theme!) and the English countryside around us. Also, being pretty addicted to social media, I find inspiration every day through Instagram. I follow and am followed by a lot of national and international florists and think it’s amazing to have this global network of incredibly talented people to tap into. 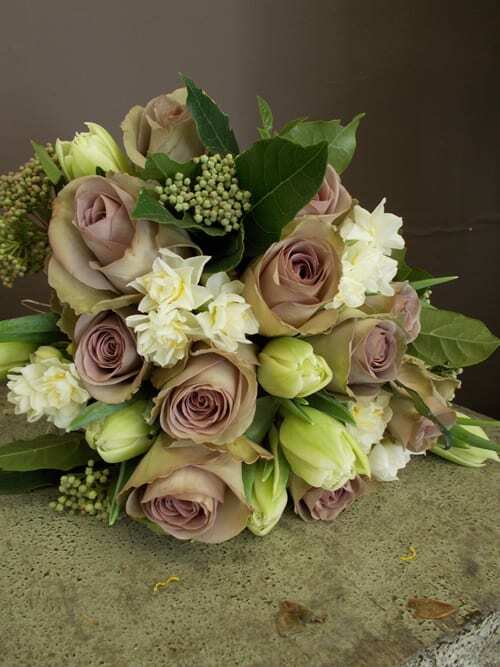 Our style is romantic English country garden with a dramatic twist. We love the use of colour and try to keep things pretty seasonal. We also adore using seed heads, twigs, berries and unusual foliage at this time of year. We have big plans! 2013 saw us take on an old Victorian walled garden to grow British cut flowers in. So Martin & The Magpie Homegrown was born. We plan to continue planning and planting this one acre garden over the winter. So in 2014, we will have our own scented roses, peonies, sweet peas, anemones, ranunculus and cottage garden flowers……the list is endless! This way we’ll have a much broader range to offer our customers, and especially our brides. 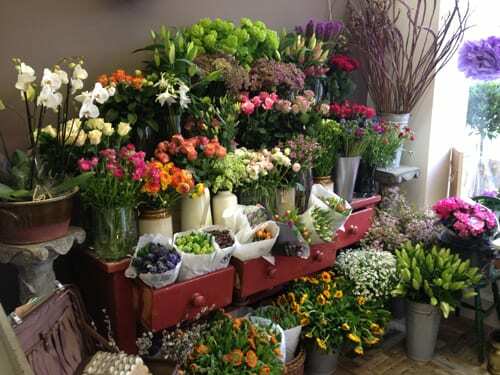 We also love the fact that the flowers only travel two miles to the shop. Our website is currently being redesigned and once finished will include an online shop for delivery locally and nationwide! I can’t pick one! 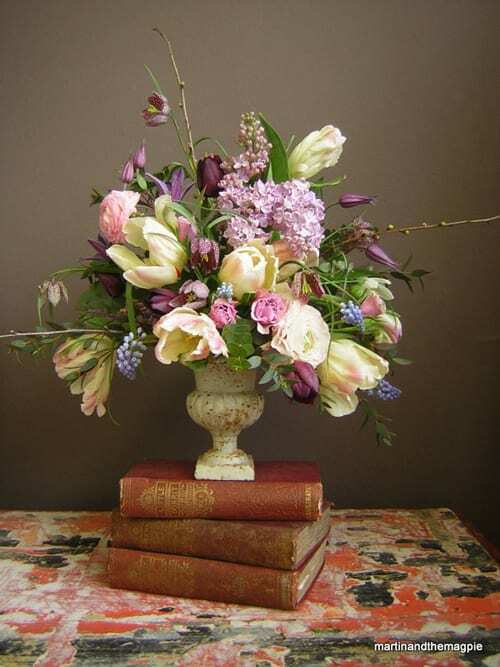 I adore French tulips, English garden roses, the cosmos we grew this year in the garden, anything slightly unusual like magnolia blossom, angelica or malus branches. But today it’s probably the most pristine white tuberose…the scent is something else. Thank you very much to Martin for all his help in compiling today’s blog post. 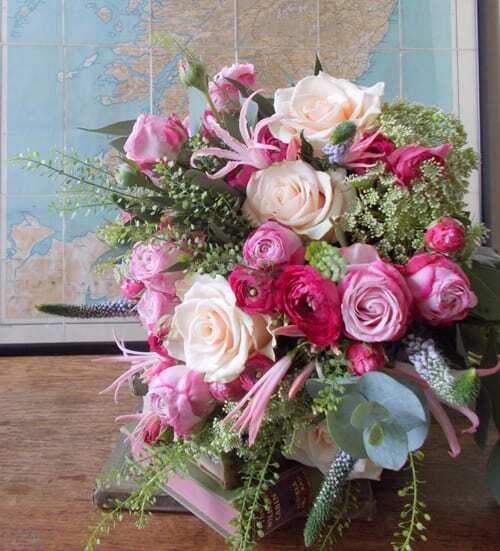 To see more of his beautiful floral designs, please do pop over to his website. I follow Martin’s blog and his flowers always look stunning. It’s great to see someone so creative and inspired in their work. I’m looking forward to the new website! Thank you so much for your kind words Caroline! We can’t wait to launch the new website! I love his arrangements they are like Dutch old masters!To be honest I much prefer this sort of style to the tight domes of flowers that seem to be fashionable now!I think it takes more skill . Thank you for your lovely comments Elizabeth! I have to admit that I’m getting more and more fond of the tighter bouquets. They make the flowers look even more scrumptious! I have had the pleasure of working with martin. He is not only a great inspirational florist but also a thouroughly nice chap. I think these domed arrangements & bouquets hide the shape of the individual flowers & they just look all of a heap! Martin and the Magpie you have a fantastic social media presence and I really feel that I have ‘got to know you’ over the past year! The walled garden has been a great development and I can’t wait to see pics of your arrangements with the addition of homegrown flowers next year. It was obviously meant to be! Thank you Caroline! Social media has definitely been a great tool and influence for us over the past. At the moment we’re very busy with getting all the bulbs and roses in the ground so next year should give us a good yield! Lovely to see how you are getting on too! I’m sure your popup shop will be a great success (and maybe something to continue doing after Christmas??)!! I’m proud of my brother, sister in law en his mother in low.